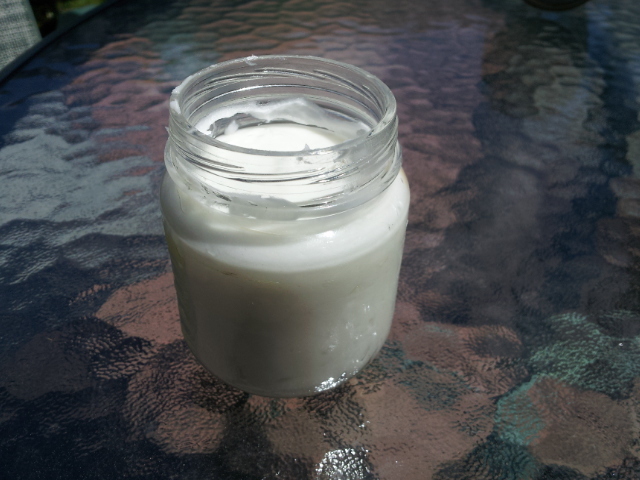 Normally I share recipes for things you would want to eat, but today I am sharing a recipe for deodorant. While you can certainly eat it, it is meant for your pits. Apparently there are toxins in many deodorants and antiperspirants found at the drug store. Aluminium is one that I especially want to avoid, and can even be found in some baking powders. When I found out about this I was determined to find a good-quality deodorant that was less harmful to my body. Skin is our largest organ, and absorbs whatever we put on it, so really, we should be putting products on our bodies that we would be OK putting in our mouths. When I first started looking for a natural deodorant, I bought a couple brands from a health food store, but they just did not work. One brand I tried, Green Beaver, actually seemed to make me smell worse, plus it felt really sticky. Little did I know that the best deodorant for me was lurking in my kitchen cupboards. Here is the recipe. I whip these ingredients together with a mixer or with a spoon and store the deodorant in small jars that are easy to access with my fingers. I put about half a finger-full per armpit, and generally need to apply it only once a day. This would really depend on your body, though, so I suggest experimenting with it. The coconut oil acts as a deodorant and the powders act as an antiperspirant. I am finding that in the summer the deodorant melts and for some reason is less effective, so it is definitely better to keep it in the fridge if you don’t have air conditioning. Not to say that it does not work at all when liquid, I just find I need to re-apply it later in the day, and when it solidifies again the ingredients appear to have separated. I often double the recipe because I usually end up giving one or two containers away to friends and family. Otherwise, each batch can last me about four months. This is way too cool and I wasn’t expecting to see it on my reader but I’m glad I did! As one of the lucky recipients of containers, I can also say this works very well for me. Does this mean I now have to make my own? No, you get special privileges because you’re my mom. I’ll put a container aside for you!